Before you head out for your next session, make sure your gear is in order. Follow our easy Pre-flight Kiteboarding Safety checklist to make sure you and your gear are safe and ready to rip. Check your leading edge for scuffs and tears. Make sure your leading edge isn’t too beat up, because scuffs and tears can get worse and rupture if you crash your kite. Check kite canopy for tears and pinholes. Hold the kite up to the sky and look through the canopy to see if any sunlight shines through. Pinholes can be repaired on-site with a kite patch kit. Larger tears should be repaired professionally. Listen for any bladder leaks. Pay special attention to areas around inflate/deflate valves and one-pump strut valves. Ensure all one-pump hoses are attached, secured, and functioning properly. Double check your inflate/deflate valve closures. Once inflated, make sure they are secured and air tight. Check for knots, kinks, or fraying in your lines. Knots that can’t be untied weaken your lines and pose a safety risk. Fresh lines can be found at www.slingshotsports.com. Check your Pigtail connections. Pigtails can fray and wear over time. Replace them if they appear worn or are at risk of breaking. Find replacement pigtails by clicking on that link directly, or check out the Bar Parts page on www.slingshotsports.com. Check your CSS bungee. If it’s stretched and dangling, it should be replaced. 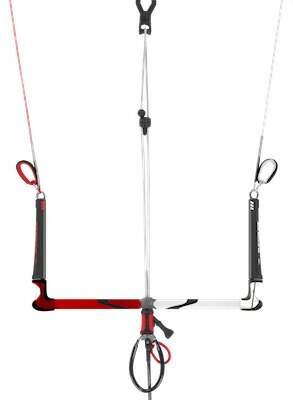 Slingshot bars come with an extra CSS bungee. CLICK HERE for a video on how to replace it. Check your safety systems. Release and reset the safety systems on your bar and leash to make sure they are clean, in good shape, and functioning properly. Give a firm pull on the chicken loop to make sure the system is reset properly. Check your line length. How often you should do this depends on how much you ride; but a couple times per season is a pretty good guideline. Stretching is normal, but sometimes lines stretch unevenly, which can cause your kite to fly unbalanced. Make sure your line lengths are consistent. CLICK HERE for a video on how to check line length and fix uneven lines. Check your de-power. Take a look at the end of your trim rope where it connects to the small black grab handle. When flying your kite fully powered, it’s important to secure the end of the de-power rope into the cleat. Leaving the rope un-cleated can cause wear & tear. If your trim rope is looking a little beat, CLICK HERE for a video on how to replace it. It’s easy to forget some of these important safety checks, but remember our Pre-flight Checklist next time you’re rigging up to ensure a safe & awesome session!